Background: Today, leishmaniasis is a widespread, infectious parasitic disease caused by Leishmania spp. Natural-derived compounds are likely to provide a valuable source of new pharmaceuticals, and among them, quercetin derivatives may have antileishmanial effects. The antileishmanial activity of 3,5,7,3',4'-pentahydroxyflavonol (quercetin) derivatives is partly attributed to the position and pKa of phenolic or catechol hydroxyl groups. Therefore, to optimize their leishmanicidal effect, the structural features of quercetin and its derivatives were improved by acylation or alkylation of hydroxyl groups and changing their pKa and consequently their activities. Materials and Methods: In this study, during a regioselective method, quercetin derivatives were synthesized. The structures of synthesized compounds were confirmed by mass, IR, 1H-, and 13C-NMR spectral data. The antileishmanial activities of compounds 1–6 were compared with glucantime as the standard drug against promastigotes of Leishmania major using standard cell-based leishmanicidal assay. 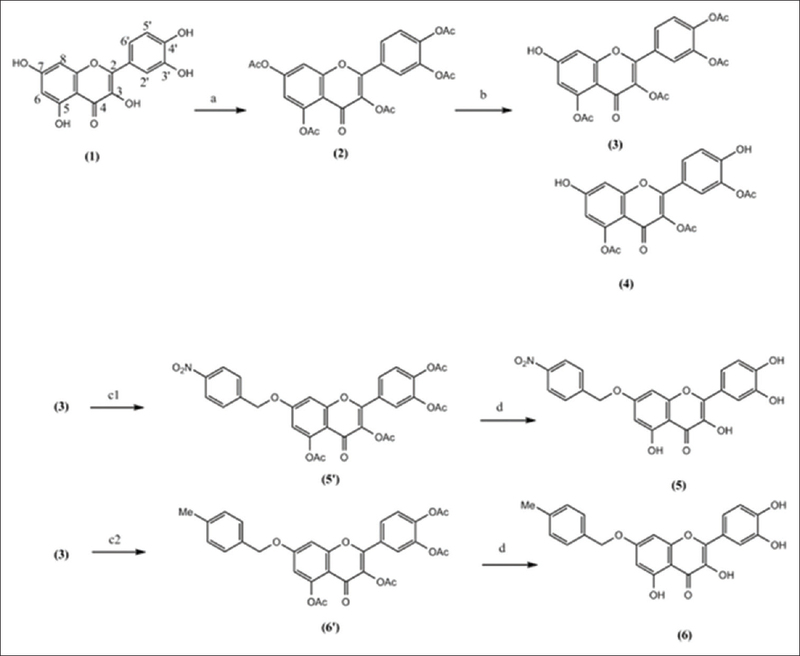 Results: In this study, during a regioselective method, two 7-O-quercetin derivatives (5 and 6), and three quercetin acetate derivatives (2, 3, and 4) were synthesized. In detail, the IC50values found against L. major were (1) 2.5 ± 0.92; (2) 2.85 ± 0.99; (3) 15.5 ± 1.95; (4) 13.5 ± 3.5; (5) 2.6 ± 0.57; and (6) 1.3 ± 0.35 μM while IC50value of glucantime as the standard drug was 88.5 ± 9.47 μM. Conclusions: The present study showed an effective antileishmanial activity of quercetin semisynthetic compounds (1–6) against in vitro promastigotes of L. major. Among them, quercetin analogs with more lipophilic and iron-chelating activity showed more antiparasite activity. Natural-derived compounds are likely to have less side effects and be more tolerable. Among them, quercetin with flavonoid structure showed antileishmanial effects. The antileishmanial activity of 3',4', 3, 5, 7 -pentahydroxyflavonol (quercetin) derivatives is partly attributed to the position and pKa of phenolic or catechol hydroxyl groups. Therefore, the aim of this research is to improve quercetin leishmanicidal effects by acylation of hydroxyl group or regioselective 7-O-substitution of electron-donating or electron capture groups and changing their pKa and consequently their activities. Progress of all the reactions was monitored by thin-layer chromatography (TLC) using natural product reagent as visualizing agent. The reaction mixtures were purified using polyamide SC6 column and hexane: acetone as solvent with increasing polarity in a gradient manner. Nuclear magnetic resonance analysis was done on a Bruker AV400 spectrometer using DMSO-D6 as solvent at 400 MHz for 1 H-NMR and 100 MHz for 13 C-NMR. Mass spectra (ESI) were performed on Shimadzu 2010EV LC-MS system (Shimadzu, Japan) and are reported in m/z. The IR spectrum was recorded on a Rayleigh WQF-510 FTIR spectrophotometer. Quercetin was obtained from Sigma (St. Louis, MO, USA). All solvents were analytical grade and purchased from Merck and used without purification unless specified. Quercetin (1, 2.0 g, 6.0 mmol), acetic anhydride (15 mm, 6.1 g, 60.0 mmol), and pyridine (15 mL) were heated to reflux under nitrogen atmosphere for 6 h. After cooling down to room temperature, the mixture was poured into 50 mL of ice water and filtered to give the product 2 in 85% yield.1 H-NMR (DMSO-D6) δ: 7.96 (m, 2H, H-2', 6'), 7.75 (d, 1H, J = 2.2 Hz, H-8), 7.63 (d, 1H, J = 8.5 Hz, H-5'), 7.27 (d, 1H, J = 2.2 Hz, H-6), and 2.43 (s, 15H, 5 acetate);13 C-NMR (DMSO-D6) δ: 169.3, 168.7, 168.3, 168.2, 168.0, 167.8, 156.3, 154.35, 153.4, 149.5, 144.42, 142.14, 133.9, 127.1, 126.7, 124.5, 123.7, 114.7, 114.05, 110.06, 20.9, 20.75, 20.4, 20.3, and 20.2; IR (KBr); νmax: 1778, 1647, 1437, 1373, and 1194 cm −1; and ESI-MS (m/z): 523 [M-H]−. To a solution of quercetin-3, 5, 7, 3′,4′-pentaacetate (1.0 g, 2.13 mmol) in anhydrous N-methyl-2-pyrrolidone (NMP) (30 mL), imidazole (50 mg, 0.74 mmol) and thiophenol (0.22 mL, 2.13 mmol) were added. It was stirred at 0°C for 1 h until the disappearance of the starting material (monitored by TLC). Then, mixture was diluted with CH2 Cl2 and washed successively with 1 N aqueous HCl and saturated sodium chloride. The organic phase was dried over anhydrous Na2 SO4 and concentrated. The residue was purified by polyamide column chromatography (hexane/acetone, 40%, v/v) to give compound 3 as white powder in 70% yield and compound 4 in 30% yield. 1 H-NMR (DMSO-D6) δ: 7.94 (dd, 1H, J = 1.6 Hz, J = 8.4 Hz, H-6'), 7.90 (d, 1H, J = 1.7 Hz, H-2'), 7.61 (d, 1H, J = 8.4 Hz, H-5'), 7.02 (d, 1H, J = 2.6 Hz, H-8), 6.74 (d, 1H, J = 2.1 Hz, H-6), 2.44 (s, 3H, acetate), 2.43 (s, 3H, acetate), 2.40 (s, 3H, acetate), and 2.39 (s, 3H, acetate);13 C-NMR (DMSO-D6) δ: 168.9, 168.8, 168.2, 168.0, 167.9, 157.6, 152.3, 150.2, 144.15, 142.1, 131.1, 127.4, 126.5, 124.5, 124.4, 123.7, 123.5, 100.95, 20.9, 20.4, 20.3, and 20.2; IR (KBr); νmax: 3132, 2939, 1774, 1628, 1369, and 1171 cm −1; and ESI-MS (m/z): 481 [M-H]−. 1 H-NMR (DMSO-D6) δ: 7.75 (dd, 1H, J = 2.2 Hz, J = 8.6 Hz, H-6'), 7.69 (d, 1H, J = 2.2 Hz, H-2'), 7.21 (d, 1H, J = 8.6 Hz, H-5'), 7.01 (d, 1H, J = 2.2 Hz, H-8), 6.71 (d, 1H, J = 2.1 Hz, H-6), and 2.41 (s, 9H, 3 acetate);13 C-NMR (DMSO-D6) δ: 168.9, 168.8, 168.7, 167.9, 157.5, 153.12, 150.09, 138.38, 126.98, 123.02, 119.57, 117.35, 109.25, 109.21, 108.5, 100.85, 20.87, 20.6, and 20.28.; and ESI-MS (m/z): 439 [M-H]−. K2 CO3 (95 mg, 0.69 mmol) and appropriate benzyl chloride (50 mg, 0.35 mmol) were added to a solution of 3 (200 mg, 0.23 mmol) in acetone (15 mL). The reaction mixture was stirred for 3 h at room temperature and then filtered. The filtrate was concentrated under reduced pressure to offer the crude product 5–6 for the next step directly without further purification. The solution of crude compound 4a–4b in NH3/MeOH (10 mL) was stirred for 1 h at 0°C and concentrated under reduced pressure. This residue was purified by reversed-phase chromatography (RPC) (water/EtOH, 30%, v/v) to give the desired compounds 5–6. Yield 60%;1 H-NMR (DMSO-D6) δ: 8.32 (d, 2H, J = 8.8. Hz, 4-nitrobenzyl-H-3'',5''), 7.81 (d, 2H, J = 8.8. Hz, 4-nitrobenzyl-H-2'', 6''), 7.66 (d, 1H, J = 2.0 Hz, H-2'), 7.63 (dd, 1H, J = 2.0 Hz, J = 8.8 Hz, H-6'), 7.00 (d, 1H, J = 8.4 Hz, H-5'), 6.9 (d, 1H, J = 2.0 Hz, H-8), 6.56 (d, 1H, J = 2.0 Hz, H-6), and 5.51 (s, 2H, 4-nitrobenzyl-CH2).13 C-NMR (DMSO-D6) δ: 175.9, 163.3, 160.4, 155.9, 147.9, 147.4, 147.1, 145.05, 144.05, 136.06, 128.3, 128.3, 123.7, 123.7, 123.5, 121.75, 119.98, 115.56, 115.2, 104.3, 97.97, 92.85, 68.58, 39.84, 39.63, 39.4, 39.2, and 39; IR (KBr); νmax: 3404, 2922, 1655, 1595, 1522, 1346, and 1165 cm −1; and ESI-MS (m/z): 436 [M-H]−. Yield 50%;1 H-NMR (DMSO-D6): 7.81 (bs, 1H, H-2'), 7.65 (bd, 1H, J = 8.4 Hz, H-6'), 7.45 (d, 2H, J = 8.1 Hz, 4-methylbenzyl-H-3'',5''), 7.31 (d, 2H, J = 8.0 Hz, 4-methylbenzyl-H-2'',6''), 6.99 (dd, 1H, J = 2.2 Hz, J = 8.1 Hz, H-5'), 6.87 (bs, 1H, H-8), 6.50 (bs, 1H, H-6), 5.27 (s, 2H, 4-methylbenzyl-CH2), and 2.40 (s, 3H, 4-methylbenzyl-Me). ;13 C-NMR (DMSO-D6) δ: 175.9, 163.9, 160.3, 155.9, 147.8, 147.3, 145.04, 137.4, 136, 133.1, 129.06, 127.9, 121.8, 120, 115.5, 115.2, 104.03, 97.99, 92.7, 69.8, and 20.75; IR (KBr); νmax: 3253, 2922, 1655, 1589, 1498, 1350,1323, and 1165 cm −1; and ESI-MS (m/z): 405 [M-H]−. Promastigotes of Leishmania major were obtained in M-199 medium and HEPES buffer from Pasteur Institute in Tehran, Iran. They maintained in RPMI medium supplemented with 10% heat-inactivated fetal bovine serum (FBS) at 25°C. Promastigotes were seeded in 96-well plates (5.6 × 106 parasites/well) with fresh RPMI medium supplemented with 10% FBS and serially diluted concentrations of compounds 1–6 (1, 10, 100 μM), blank (wells without parasites), negative controls (untreated parasites), and glucantime as positive control, and incubated at 25°C. Using a neobar lam on an inverted microscope, survived parasites were identified and counted. As is shown in [Figure 1], quercetin (1) was acetylated by acetic anhydride in pyridine at 180°C for 6 h (85%). After purification of quercetin pentaacetate, by polyamide column using hexane: acetone (70:30), it was 7-O-regioselectively deacetylated using thiophenol and imidazole in NMP as solvent at −10°C for 1 h. After purification, it yielded quercetin-2, 5, 3′,4′-tetraacetate (3) with free hydroxyl group on C-7 (60%) and quercetin-2, 5, 3′′-triacetate (4) with free hydroxyl groups on C-7 and C-4' (40%). Compound 3 was arylated with 4-methylbenzyl chloride and 4-nitrobenzyl chloride, separately. Reaction mixture was then deacetylated by treatment with ammonia (2M) in acetone at 0°C for 5 min. Excess ammonia was neutralized by adding HCl (0.5 M). Finally, 7-O-arylquercetins 5 and 6 were purified by RP-18 RPC using water: methanol (30:70) as solvent. Quercetin derivatives were tested to determine their leishmanicidal activities after 48 h of treatment. They showed a dose-dependent effect on L. major promastigote growth. In detail, the IC50 values found against L. major were (1) 2.5 ± 0.92; (2) 2.85 ± 0.99; (3) 15.5 ± 1.95; (4) 13.5 ± 3.5; (5) 2.6 ± 0.57; and (6) 1.3 ± 0.35 μM, and IC50 value of glucantime as the standard drug suppressed promastigotes was 88.5 ± 9.47 μM [Figure 2]. There are three possible domains in quercetin analogs which can chelate metal ions. These are between ortho 3' and 4'-dihydroxyl groups on the B ring, 3-hydroxy and 4-oxo in the C ring, and 5-hydroxy and 4-oxo in the A ring. Protection of these chelating sites is expected to reduce the interaction of ligand with Fe ions. In this agreement, compounds 3 (quercetin-2, 5, 3′,4′-tetraacetate) and 4 (quercetin-2, 5, 3′-triacetate) with no free chelating group were less active than compounds 1 (quercetin), 5 (7-O-paranitrobenzylquercetin), and 6 (7-O-paramethylbenzylquercetin) with free chelating groups localized on C-5, C-3, and B ring. Therefore, 5-OH, 3-OH, and ortho 3' and 4'-dihydroxyl groups in ring B are involved in leishmanicidal activity in quercetin derivatives. In comparision with compound 5 with paranitrobenzyl and 6 with paramethylbenzenyl on C-7, compound 6 showed more antileishmanial activity probably because of increased chelating activity of 5-hydroxy and 4-oxo in A ring, and also more parasite membrane penetration. Quercetin analogs probably exert their effect by their antioxidant and reductant properties. They react with ferric ions (Fe 3+) and make quercetin quinones and ferrous ions. Ferrous ions are chelated by quercetin derivatives lead to depletion of Fe in cells. Therefore, we suggest that iron depletion is one of the mechanisms of quercetin analogs against Leishmania infection. In this agreement, in the study directed by Sen et al., they showed that quercetin as a lipophilic iron chelator interferes with iron metabolism in Leishmania donovani and targets ribonucleotide reductase to exert leishmanicidal activity. In fact, ribonucleotide reductase activity, which regulates cell proliferation, is dependent to the iron supply, and iron deprivation by this mechanism may exert its antileishmanial effect. Ben-Othman et al. reported that iron chelators such as 8-hydroxyquinoline inhibit the expression of genes in Leishmania that are related to the infectivity and/or virulence of the parasites. In the study conducted by Soteriadou et al., they showed that in vitro incubation of L. major promastigotes with iron-chelating compounds such as deferoxamine (DFO), L1, and 1,2-diethyl-3-hydroxypyridin-4-one (CP94) in a dose-dependent manner suppressed parasite growth. In a reverse manner, addition of referrated iron chelators like FeDFO, Fe (Ll)3, and Fe (CP94)3 to cultured media restored parasite growth, which means that proliferation inhibition is caused by the iron chelator. However, because of this point that quercetin analogs with protected chelating groups (compounds 2, 3, and 4) and those with iron-chelating activity (compounds 1, 5, and 6) both inhibit L. major growth in vitro, it seems that reduction in promastigote growth is not dependent to iron chelation alone, and other mechanisms are incorporated. In this regard, Virginia Iniesta team founded that cellular Leishmania infection is dependent to arginase enzyme, which generates L-ornithine essential for Leishmania growth. Afterward, Manjolin et al. showed that quercetin exerted its antileishmanial effect by inhibitory effect on arginase enzyme, which is essential for parasite proliferation. In a different study, Fonseca-Silva et al. reported another mechanism for the antileishmanial activity of quercetin against L. amazonensis promastigotes. They founded that reactive oxygen species production and mitochondrial respiratory dysfunction induced parasite death (IC50 value of 31.4 μM) through collapse of mitochondrial membrane potential. Mittra et al. reported also that quercetin inhibited the growth of L. donovani promastigotes by interacting with DNA topoisomerases and promoting site-specific DNA cleavage leading to cell cycle arrest and apoptosis with IC50 value of 45.5 μM. In fact, quercetin mechanism of action is not only related to its chelating property but also because of multiple quercetin targets that have been identified for the treatment of leishmaniasis include: arginase, ribonucleotide reductase, topoisomerase II, and mitochondrial dysfunction made quercetin analogs interesting for new antileishmanial drug designs. The present study showed an effective antileishmanial activity of quercetin semisynthetic compounds (1–6) against in vitro promastigotes of L. major. Among them, quercetin analogs with more lipophilic and iron-chelating activity showed more antiparasite activity. Based on calculated pKa values in quercetin, 5-OH in A ring is the strongest chelator site in quercetin analogs, which because of the intermolecular hydrogen bond between 4-oxo and 5-OH is relatively inactive. In this study, we investigated the effects of electron withdrawing or electron donor substituents addition on C-7 on pKa of 5-OH and its chelating activity. The results of this paper showed that 7-O-paramethylbenzyl substitution with electron donating and more lipophilic properties increased antileishmanial activity in vitro against L. major promastigotes (IC50 =1.3 ± 0.35 μM) more than 7-O-paranitrobenzyl substitution with electron-withdrawing effects (2.6 ± 0.57) or quercetin alone (2.5 ± 0.92). This paper is part of the thesis of Ehsan Ostadhusseini submitted for the fulfillment of the degree of Pharm D in Faculty of Pharmacy and Pharmaceutical Sciences, Isfahan University of Medical Sciences, Tehran, Iran. This work was supported by a grant (no. 2911104) from the Isfahan Pharmaceutical Sciences Research Center, Isfahan University of Medical Sciences. Chen M, Christensen SB, Theander TG, Kharazmi A. Antileishmanial activity of licochalcone A in mice infected with Leishmania major and in hamsters infected with leishmania donovani. Antimicrob Agents Chemother 1994;38:1339-44. Singh N, Kumar M, Singh RK. Leishmaniasis: Current status of available drugs and new potential drug targets. Asian Pac J Trop Med 2012;5:485-97. Rocha LG, Almeida JR, Macêdo RO, Barbosa-Filho JM. A review of natural products with antileishmanial activity. Phytomedicine 2005;12:514-35. Croft SL, Seifert K, Yardley V. Current scenario of drug development for leishmaniasis. Indian J Med Res 2006;123:399-410. Ouellette M, Drummelsmith J, Papadopoulou B. Leishmaniasis: Drugs in the clinic, resistance and new developments. Drug Resist Updat 2004;7:257-66. Tasdemir D, Kaiser M, Brun R, Yardley V, Schmidt TJ, Tosun F, et al. Antitrypanosomal and antileishmanial activities of flavonoids and their analogues: In vitro, in vivo, structure-activity relationship, and quantitative structure-activity relationship studies. Antimicrob Agents Chemother 2006;50:1352-64. Bhakuni DS, Satish S, Shukla YN, Tandon JS. Chemical constituents of Diospyros buxifolia, D. tomentosa, D. ferra, D. lotus, Rhus parviflora, Polygonum recumbens, Balanites aegyptiaca and Pyrus pashia. Phytochemistry. 1971;10:2829-31. Mattarei A, Biasutto L, Rastrelli F, Garbisa S, Marotta E, Zoratti M, et al. Regioselective O-derivatization of quercetin via ester intermediates. An improved synthesis of rhamnetin and development of a new mitochondriotropic derivative. Molecules 2010;15:4722-36. Park HR, Yoon H, Kim MK, Lee SD, Chong Y. Synthesis and antiviral evaluation of 7-O-arylmethylquercetin derivatives against SARS-associated coronavirus (SCV) and hepatitis C virus (HCV). Arch Pharm Res 2012;35:77-85. Zhong D, Liu M, Cao Y, Zhu Y, Bian S, Zhou J, et al. Discovery of metal ions chelator quercetin derivatives with potent anti-HCV activities. Molecules 2015;20:6978-99. Asghari G, Zahabi F, Eskandarian A, Yousefi H, Asghari M. Chemical composition and leishmanicidal activity of Pulicaria gnaphalodes essential oil. Res J Pharm 2014;1:27-33. Sen G, Mukhopadhyay S, Ray M, Biswas T. Quercetin interferes with iron metabolism in Leishmania donovani and targets ribonucleotide reductase to exert leishmanicidal activity. J Antimicrob Chemother 2008;61:1066-75. Huynh C, Andrews NW. Iron acquisition within host cells and the pathogenicity of Leishmania. Cell Microbiol 2008;10:293-300. Ben-Othman R, Flannery AR, Miguel DC, Ward DM, Kaplan J, Andrews NW, et al. Leishmania-mediated inhibition of iron export promotes parasite replication in macrophages. PLoS Pathog 2014;10:e1003901. Soteriadou K, Papavassiliou P, Voyiatzaki C, Boelaert J. 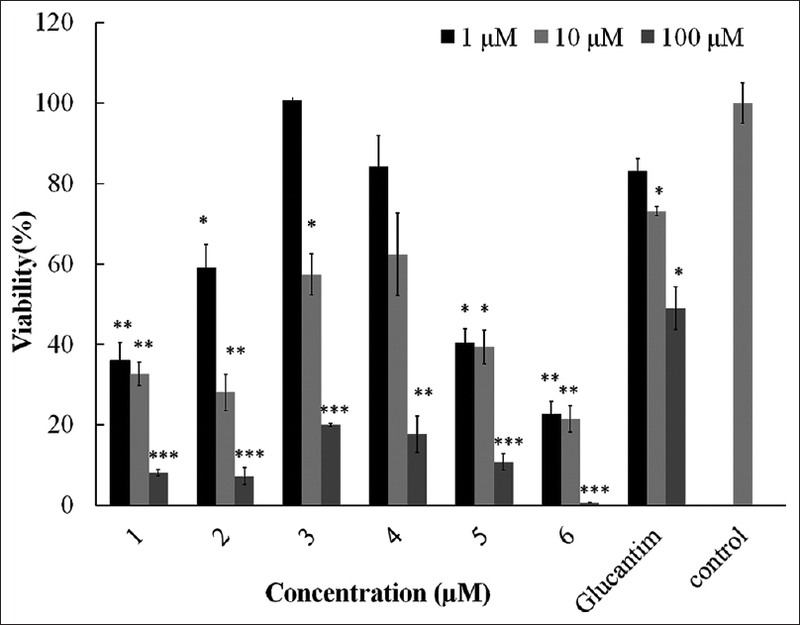 Effect of iron chelation on the in-vitro growth of Leishmania promastigotes. J Antimicrob Chemother 1995;35:23-9. Iniesta V, Gómez-Nieto LC, Corraliza I. The inhibition of arginase by N (omega)-hydroxy-l-arginine controls the growth of Leishmania inside macrophages. J Exp Med 2001;193:777-84. Manjolin LC, dos Reis MB, do Carmo Maquiaveli C, Santos-Filho OA, da Silva ER. Dietary flavonoids fisetin, luteolin and their derived compounds inhibit arginase, a central enzyme in Leishmania (Leishmania) amazonensis infection. Food chemistry. 2013;141:2253-62. Fonseca-Silva F, Inacio JD, Canto-Cavalheiro MM, Almeida-Amaral EE. Reactive oxygen species production and mitochondrial dysfunction contribute to quercetin induced death in Leishmania amazonensis. PLoS One 2011;6:e14666. Mittra B, Saha A, Chowdhury AR, Pal C, Mandal S, Mukhopadhyay S, et al. Luteolin, an abundant dietary component is a potent anti-leishmanial agent that acts by inducing topoisomerase II-mediated kinetoplast DNA cleavage leading to apoptosis. Mol Med 2000;6:527-41.